Do you remember how this site doesn’t like Star Fluxx, and by extension all Fluxx based products? Of course you do – I mean, it was our very fifth, or maybe very sixth review – a big number anyway. An important review. A seminal review, even. I was down in Manchester, remember? Well… oh. Sorry, I just thought – I just thought you and I had something. Oh, no – you don’t need to go and read it. It’s just… you know, you put work into a relationship and then… it doesn’t matter. It’s not you, it’s me. I’m just – I’m just going through some stuff right now. It’s fine. No, I’m not crying you’re crying. I bring this up not to take you on a whirlwind guilt trip but to remind you that I really didn’t like Star Fluxx and a large part of that was because of how arbitrary the chaos of play ends up being. It’s not a game that is about meaningfully controlling a highly febrile set of rules and mechanics. I mean, that’s how it presents itself but it’s a god damned lie. Fluxx is about making noise and playing cards until by random happenchance the game suddenly ends to the abrupt surprise and secret relief of everyone. If you’re lucky, the game will end quickly. If you’re not, well – let’s just say that I hear stories about a family in Rhode Island who are still playing their first game of Star Fluxx and have been for six years. The randomness that some people find enchanting about Fluxx games is the thing that I hate about them. It’s frantic activity, but here on Meeple Like Us we’re interested in more than games as just a way to kill time. Red7 is Fluxx as designed by someone that understands how games are supposed to work. It’s a competent, playable execution on the same anarchic principle of providing simple rules and mechanisms that permit players to modify those rules during play. Where Fluxx is chaotic, Red7 is thoughtful. Where Fluxx is unmanageable, Red7 is deliberative. Star Fluxx is a street fight where ten untrained fighters stab their switchblades wildly at everything that moves. Red7 is a comparatively sedate Judo tournament where players are elegantly using the momentum of their opponents to bring themselves closer to victory. While the games share a common core of malleable rules lawyering, they really could not be more different in the effectiveness of their execution. Red7 is a good game, and Fluxx is a the psychic equivalent of a snake in a can. In Red7, there is only one core, immutable role – at the end of your turn, you need to be winning the game. Each player has a hand of cards consisting of a set of numbers and colours. These range from violet one up to red seven. These cards are ordered according to a precedence. 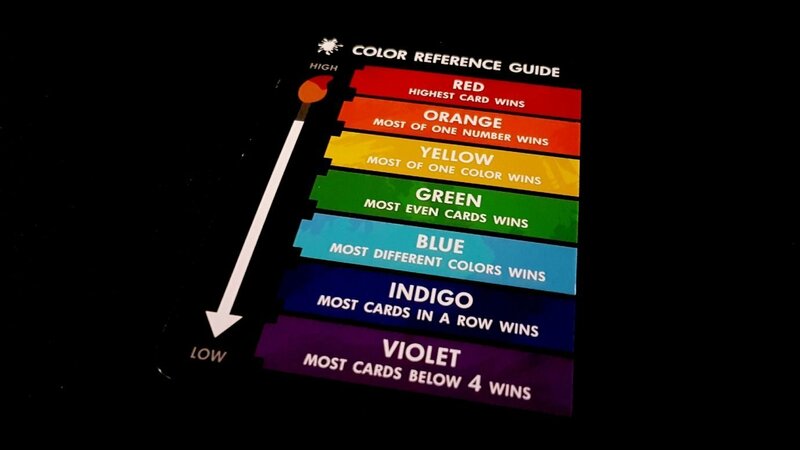 They use rainbow colours – red is a better card than orange, which is a better card than yellow, and so on. Each card has a particular win condition associated with its colour. These cards are either going to be played to a ‘palette’ in front of the player, or to the ‘canvas’. The palette is your game state, and it’s used to evaluate whether you’re winning. The canvas is the game rule, and the top most card there is used to dictate how winning is determined. During a turn, a player can choose where their cards go – one in front of them to satisfy a winning condition, one to the canvas to change the winning condition, or one in front of them and another to the canvas to change the winning condition to one they are now winning. If you can’t win with any of your options, you pass and are out of the round. The start of the game always begins with red, and the win condition of red is that the player with the highest card wins. Each player also starts with a random card played to their palette. From that point on, everyone takes their opportunity in turn order to engineer the circumstances where they are on top. If players are careful, they’re also playing the cards that ensure their opponents likely cannot change the game circumstances in their favour. Playing cards down becomes part advancement of your own agenda, part trap you’re setting for other players, and occasionally part building block of your strategic master-plan. Some cards have icons on them that trigger when they’re played to your palette – these might let you draw new cards, steal cards from an opponent, or play multiple cards from your hand. If you change the win condition by playing a card that has a face value higher than the number of cards in your palette, you draw another card. Drawing new cards is important – you need to keep playing until you win, and you’ll rapidly exhaust your cards to make that happen. Your chances to draw cards will diminish as time goes by, and so each turn becomes one of satisfying a win condition with the smallest outlay of your precious resources. Here you can see how the mechanistic turmoil of Fluxx has been properly tamed and harnessed. This isn’t a game with a playing time that may as well be decided by a random number generator – this is a short, intense burst of activity with a known and fast approaching termination point. This isn’t a game where you have to sacrifice strategic and tactical considerations for sheer reactive play – you can carefully and intentionally make meaningful choices with every card you select and every destination for it that you pick. It’s still invested with a genuine, rollicking energy but that energy gets directed towards an intended goal rather than radiated outwards in futile waves. That strikes me as a much better use of everyone’s time because the consequences of previous rounds are never simply wiped away – you live with the palette you’re constructing, and that has implications for everything you do as time goes by. 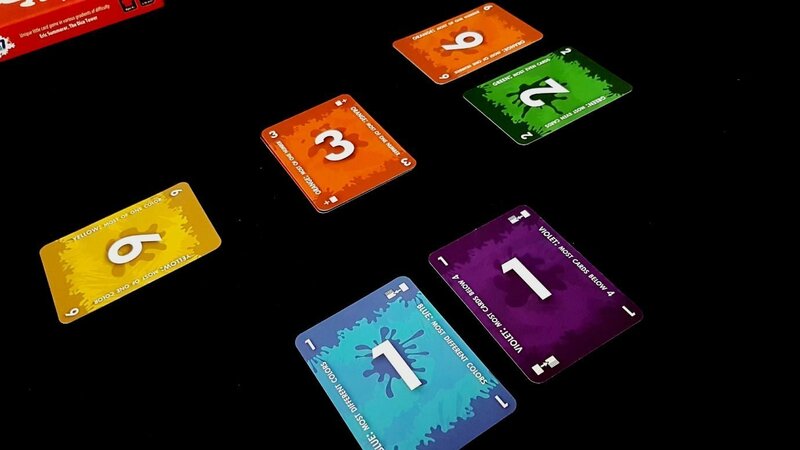 In Fluxx, your choices are rarely meaningful – you play a card for its chaos value because playing it for its winning potential is aspirational at best. If you can’t win the current round in Fluxx you may as well not plan for the next since everything, including what winning means, will likely have changed. in the interim. It’s like those old 80s video games where you needed to time your shot to get past the gap in a rotating obstacle. It’s satisfying to pull that off but if you miss there’s not a lot of fun in the waiting for your next opportunity because the gap is going to be at a different place and moving at a different speed. Your downtime is not spent planning, it’s spent waiting. The time you’re not playing in Fluxx is time you’re actively disengaged with it as a game. At best, it becomes a spectator sport. Someone murdered my spreadsheet and left it here as a warning. Red7 though invests every move with impact – look at the cards above. One player has two ones played to their palette, one of blue and one of violet. That’s not an accidental outcome, and it’s not even particularly aimed at winning the current round. It’s about creating the circumstances that make winning the next one easier. That’s a palette that will help in satisfying ‘most of one number’, and ‘cards below four’, as well as ‘cards of different colours’. That in turn influences what the sensible options are for an opponent. 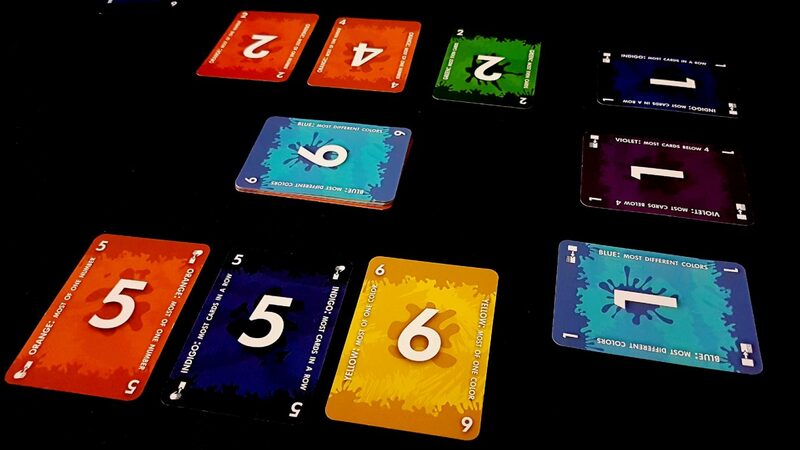 The player with the green two and orange six is fulfilling ‘most even cards’, ‘highest card’ (because orange is better than yellow), and cards of all different colours. Those aren’t palettes that came about as a temporary need to satisfy a transient win condition – they’re tools being constructed in the service of a longer term strategic goal. 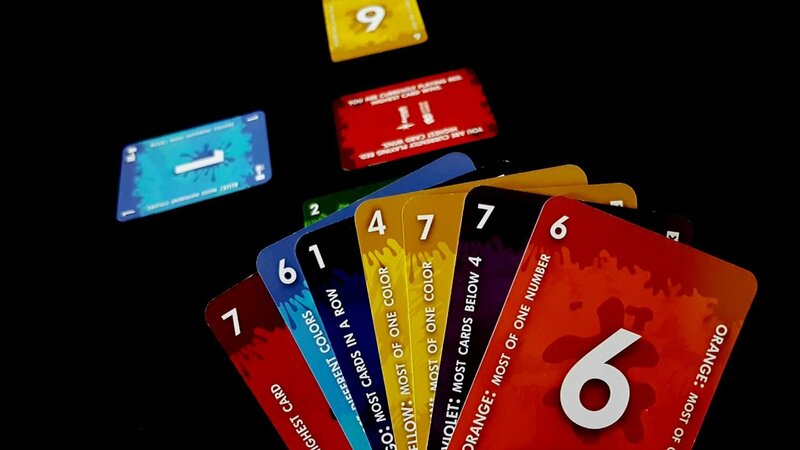 These are reasons why Red7 accomplishes the task of offering a game that is better than Fluxx, but they also highlight some of the fundamental weaknesses of this style of design. There are only seven possible win conditions, driven by the seven different colours, and that makes this an intensely knowable puzzle. There are cards that are quite simply better than other cards (the eponymous red seven for example) even if they have the same face value. That has a profound impact on how fair the game can seem and how interesting it becomes after you’ve gained the necessary experience to understand how the various parts interlock. You don’t ever end up with funny interactions of cards in Red7. You never get the Fluxx experience of ‘play all your cards and then draw six more’ – that is going to generate laughter even if it doesn’t generate more fun. Fluxx incorporates acts of mandated self-harm into its game systems and those are always worth a giggle. In Fluxx you might find yourself discarding all your cards down to one, drawing a new card and playing it instantly only for it to win the game for an opponent. Whenever people have tried to convince me that I’m wrong in my views on Fluxx, the argument invariably centres around the fun interactions of cards that resulted in moments of comedy gold. 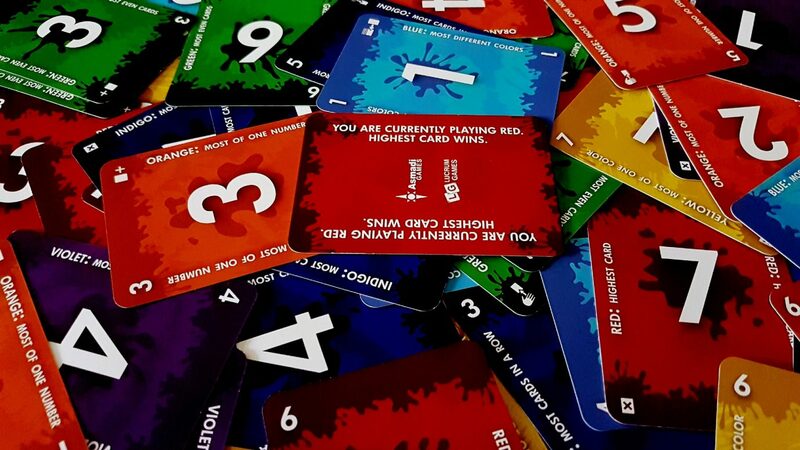 Red7 is far more po-faced than that because it constrains the chaos more tightly – you change a rule one at a time, you don’t meaningfully change the entire game to unexpected and unintended outcomes. Swings and roundabouts, mate – it’s not possible to have everything in every design and Red7 has sacrificed rule malleability for actual design competence. I’m happy with that trade off. And yet, Red7 still does bring some of the structural problems of Fluxx into play. It’s a very luck based game, and some players are simply going to be dealt much better hands. That’s true in most card games, but there’s a difference in how the best ones compensate for it. With something like Race for the Galaxy, you can turn your hand into an effective machine regardless of what you get dealt – your job is to make sure that you take advantage of the opportunities you have. I’ve won games of Race for the Galaxy in surprising ways simply by reading the future in the entrails of my cards. Similarly in San Juan – what your starting hand does is indicate, heavily, what your path to victory is likely to be. With Red7, you might just get dealt a hand that is worse in every respect than that of your opponents and in that scenario it doesn’t matter how you play – you’re going to lose. That’s important, because you need to be winning at the end of every round and sometimes through no fault of your own it’s not possible just because of the cards you were dealt. In that respect Red7 has the same systemic issues as games of poker – luck is a major feature, and skill can only partially compensate. Sometimes, especially in four player games, you might be out of the game before you even get to play a single card. That though at least is understood as a risk in games like this, In exchange for rounds where you may not have an awful lot of fun you get scenarios where you can really dig your metaphorical fingers into the game state and have a good fossick about. Red7 encourages a certain economy of play, for example – it encourages conservation of your best cards and still permits the leveraging of cards that don’t meaningfully contribute to your palette. Which card you play to the palette and which to the canvas matters a lot, and it’s not always purely based on face value. The lowly violet one might be worth playing over the all-powerful red seven – while that card trumps all others in a comparison, that’s only true when the comparison is according to favourable criteria. Those cards too have to last you – you need to be able to play a card, and win, every turn. There’s a tightness to this design that makes it compelling beyond its seemingly simplistic rule-set. The limited collection of rule changes is a boon here because you can bundle awareness of the possibilities into your decision making and know that nobody is going to play down a combination that utterly breaks the game. 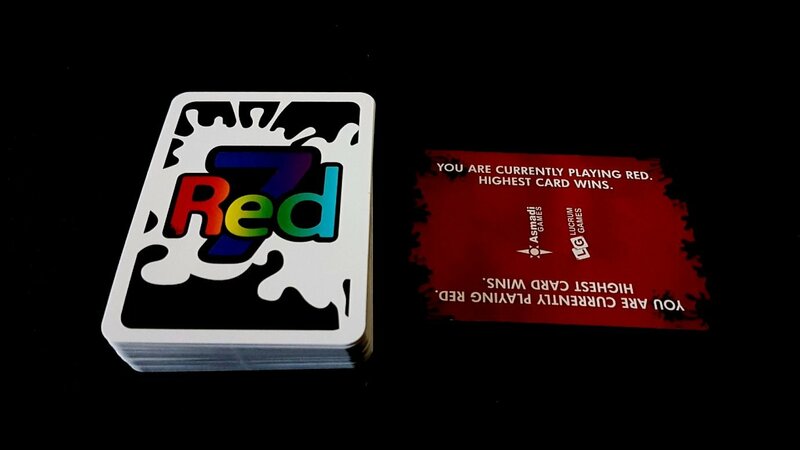 I can’t say that Red7 has really filled me with excitement, but it’s cheap enough to be worth a purchase and portable enough that you can bring it with you to potentially awkward social events in order to make them even more potentially awkward. When we were down at UKGE, I watched a group of attendees bonding over a few games of Red7 in the hotel foyer. It seemed ideal as a warm up for the more intensive fare that would follow but that’s a highly situational benefit. 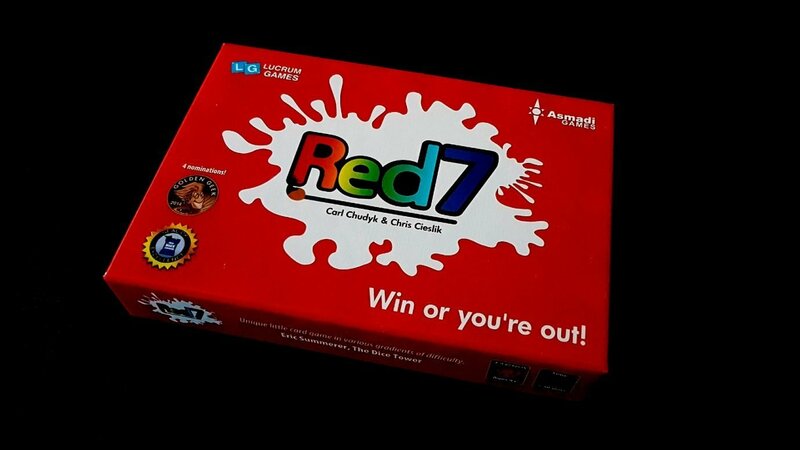 You never know though – perhaps you’ll make a friend for life at some point by bringing Red7 out at a tedious wedding and staring at a table full of strangers while you ask ‘Would you like to play a game?’. It’s simple enough that they’ll learn it easily and fun enough that they might even enjoy it. It’s not the most intensive praise we’ve ladled onto a game by these designers, that’s certainly true. Red7 does deserve considerable affection though for saving us all from ever having to play Fluxx ever again.